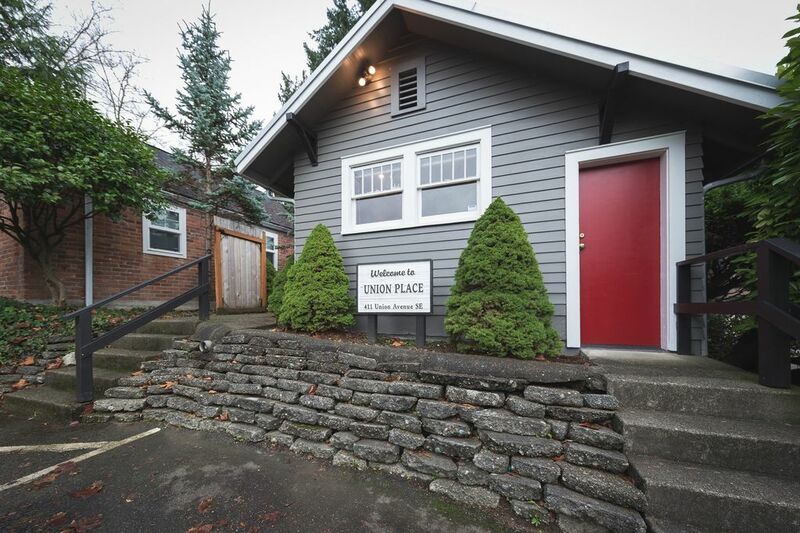 This charming cottage has all of the modern amenities you'll need for your stay in Downtown Olympia. Featuring lots of natural light, a large updated galley kitchen, media room with Cable/DVD/Netflix that closes to become a 2nd bedroom, a large sitting room, and huge master bedroom. Union Place has central heat, is beautifully furnished and stocked with everything you'll need to enjoy your home away from home. Robes & slippers await you and there's a private courtyard to enjoy as well as a secluded porch. Union Place has a large parking lot so leave your car behind while you explore what Olympia has to offer on foot, bicycle or public transit. I've lived in Olympia for over 20 years and most of it has been spent working on "heads in beds" which means I specialize in finding people the best place. I've owned two B&Bs and have hosted over 1000 people and still love it. So if you're interested in more than just a tourist's eye view of Oly, I can hook you up with recommendations on realtors, schools, and other connections you might need for the long haul. The Union Place is a solid little house probably built in the 1930's. It is filled with quality items, like the cookware, glassware, etc. It has good security and is closer to everything. One benefit of this location is that it is situated in a community where we all keep an eye out for each other. There's a trio of houses that share our parking lot and we all know each other and share items as needed. Besides your own courtyard, there's a larger covered area aways out in the parking lot for smoking with others, playing cards or just enjoying a summer breeze. toilet, combination tub/shower, Features a deep tub perfect for a long soak. So close to the Capitol Building that you can see it from the porch! Also on the edge of downtown and on all the bus lines. Central heat and space heaters provided. All bedding, blankets and pillows provided. All towels provided as well as robes and slippers for 2. Dual living room & media room includes large smart TV, DVD player, Netflix & plenty of seating for 6-8 people. Drip Coffee Maker, Fair-Trade Organic Coffee & Filters provided. Pots, Pans, Dishware, Silverware, Cooking Utensils, Serving Bowls & Bake-ware provided. Large galley kitchen well equipped for your cooking & baking needs. The quaint dining room is located near two large windows in a nook off of the kitchen. The table expands to seat 4. Large smart TV with cable. Various toys & games provided. Enjoy the private courtyard or the secluded front porch. Provisions for young children include toys, a high chair and a pack and play. The house was cozy and welcoming. Very clean and fresh, for allowing pets. The location was awesome. So close to downtown, we were able to walk to many locations. This is my first time using Airbnb and the experience sold me as this was perfect for us. The accommodations are quiet, private and convenient. The place is clean and comfortable with lots of windows. We were delighted with the kitchen ready for cooking with dishes, pots and pans, spices, coffee and toaster ready for use as we enjoy cooking together. We plan to return when Olympia is our destination. Many thanks! It was a pleasure to host both of you at Union Place. You were clean, friendly, and grateful guests - the Triple Crown! Glad the sun made a prolonged appearance for your 'winter retreat' to the warm side of the mountains. :) We hope to see again in the future. It's a cute house with everything we needed. Clean, well maintained house with an updated kitchen - near the bus line. My only concern was the exterior access into the house via a closet door in the bedroom. Easily remedied if owner would install an interior lock on the closet door so guests can feel safe and secure at night.